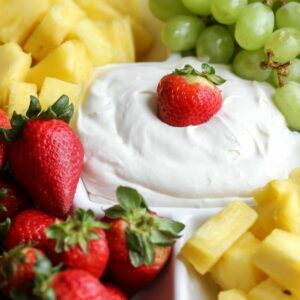 This Cheesecake Fruit Dip is one of the best fruit dip recipes you will ever try! It takes just 5 simple ingredients - cream cheese, vanilla, sugar, marshmallow fluff, and cool whip - and ALWAYS vanishes in minutes! Definitely a crowd favorite! Beat cream cheese (that is room temperature) with sugar and vanilla until well mixed. Fold in cool whip and marshmallow fluff. Place in a bowl and chill.